I am really bad at taking care of my skin. Besides my daily cleanse-tone-AHA cream routine, I often forget to put sunscreen/block on or moisturise my neck. I don't go for facials, or purchase a lot in the way of skincare. And I certainly don't have perfect skin. I routinely break out in huge zits that resemble a bee sting and dominate my face. It's almost as if my skin is stuck in a time warp and refuses to grow up out of teenage puberty. Which is funny, since I never had skin problems as a teenager. So in a vain (no pun intended) attempt to help my skin along, I decided to pick up a cloth facial treatment mask on my last trip to Priceline. There wasn't a lot of choice, but I was attracted to the Skinvitals range. 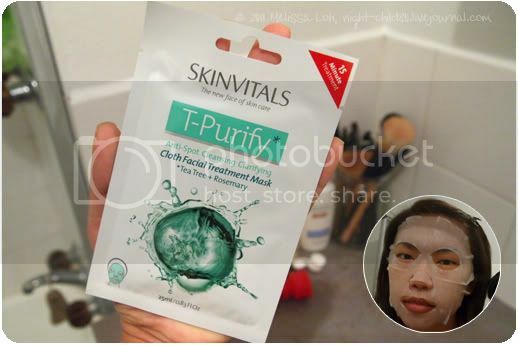 The T-Purify treatment mask has tea tree oil, rosemary, eucalyptus and collagen. I know collagen molecules are too large to be absorbed by the epidurmis, but I was more interested in the tea tree oil. The SO used to get a number of small breakouts when we were first dating, so I bought him the Bodyshop tea tree facial foaming wash to try and it worked really well. After 15-20 minutes of watching television covered in a super moist mask, I was surprised by how supple my skin felt post-treatment. I can definitely see how one can get addicted to the stuff, but at almost AUD$4 for 1 sheet, it might be a tad pricey as a weekly treat. Guess I'll have to turn to GMarket and see what I can find.